Consumer ReportsThe iPhone 6 undergoes a stress test. Back in September, the internet was flooded with people worried that their new iPhone 6 and iPhone 6 Plus units would bend if kept in their pockets. 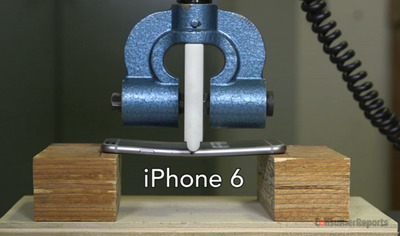 Apple acted swiftly to shut down the so-called “Bendgate” scandal, inviting reporters to their stress-test facility and issuing a statement claiming the warping issue was “extremely rare” and that “only nine” customers had come forward. 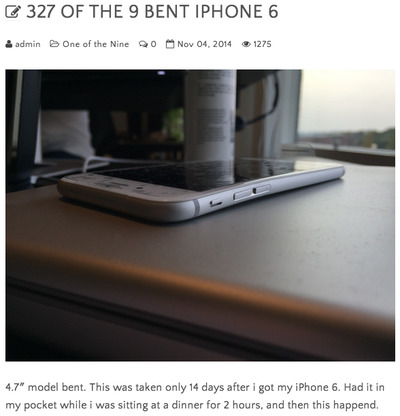 A new website called “One of the Nine” is refuting Apple’s claim, however. It’s uploading hundreds of pictures of bent iPhone 6 and 6 Plus units from users claiming they haven’t done anything to deliberately warp the device. There’s even a video showcasing all of the submissions, accompanied by the song “Bananaphone” by Raffi, as Te International Business Times points out. In a blog post on the site, the anonymous founder of “One of the Nine” insists the website began as a “tongue in cheek” way to “find those nine people.” But after receiving far more submissions, he realised the issue may be bigger than Apple is letting on. In addition to accusations that his website has an agenda, the founder says he’s also received death threats. “One of the Nine” has brushed off these accusations and reactions for now, and has continued to publish any submissions they receive both on their website and via Twitter. You can check out “One of the Nine” for yourself by clicking here.